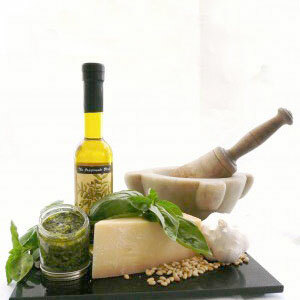 The most famous of all culinary masterpieces from the Italian Riviera is its basil Pesto sauce. When visiting my cousins in Sestri Levante, a beautiful city near the Cinque Terra, Anna Maria served Trofie al Pesto. Trofie is Ligurian pasta made with flour and water, no eggs. Her delicious pasta was topped with pesto, cut boiled potatoes and cooked, cut string beans. Pesto derives its name from the same Latin root as the English word pestle, in reference to the sauce’s crushed herbs and garlic. Many families in Italy still prepare their own Pesto using their small-leafed basil and a large marble mortar and wooden pestle. The pounding and crushing action of the pestle gives the Pesto a smooth, creamy texture and brings out the flavor of all the ingredients. However, you can use a food processor! Rinse and pat dry the basil leaves, if necessary. Place in food processor the basil leaves, garlic, pine nuts, and Extra Virgin Olive Oil. Store Pesto in a jar in the refrigerator (or freeze) until ready to use. Always store your finished Pesto with an extra protective layer of…your best Extra Virgin Olive Oil. Save small jars and freeze Pesto for those winter pasta dishes and soups. Try making Pesto with a mortar and pestle….just once!